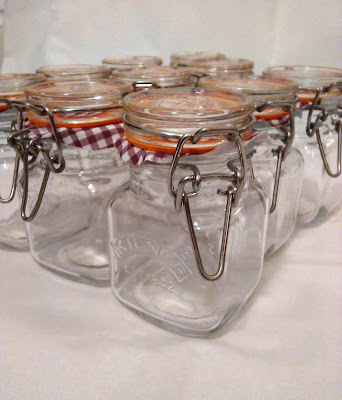 How to sterilise Jars, ready for your homemade goodies! I thought it might be useful to mention how one sterilises jars as I certainly had no idea until I wanted to make my first jam. Of course, the same goes for marmalade, chutneys, pickles and mincemeat (the Christmas cakes and my all favourite mince pie variety, that is!! and not the kind of minced meat Rachel from 'Friends' used for her trifle!). 3. Place jars on a baking sheet, on a baking tray, in the middle of the oven for approximately 20 minutes or until you see they are completely dried. *Dry heat can damage rubber seals therefore, if you are using Kilner jars, it is best just to boil their rubber seals seperately rather than put them in the microwave or oven. * Do not use metal lids, or anything with metal in the microwave, instead boil them, just as you would the rubber seals. *Always put your jam or other in the jars whilst they are both hot. Do not let the jars cool down as, if they are cool, they could break when having something hot poured into them. I haven't mentioned sterilising in dishwashers and agas and all sorts of other things I may be missing, just because I haven't tried them. However, if you have any other sterilising methods or tips, please do share them in the comments below. I always imagined that pesto would be difficult to make and time consuming but I couldn't have been more wrong! Pesto is so simple to make yet utterly satisfying! This recipe is for an avocado pesto! Avocado pesto is so versatile. It can be used with all kinds of pastas and sandwiches. For vegans, you can take away the cheese from this recipe as the avocado itself is such a creamy fruit, it doesn't need anything else added to it! For vegetarians, mixing the pesto with all sorts of pastas make for divine dishes and for meat eaters, I personally love and recommend topping some on your burger. Heaven for all to enjoy!! Also, if one is cutting down on oils, you can omit the olive oil in the recipe, as of course the avocado is wonderfully oily itself! This recipe makes enough for a medium bowl's worth of pesto. 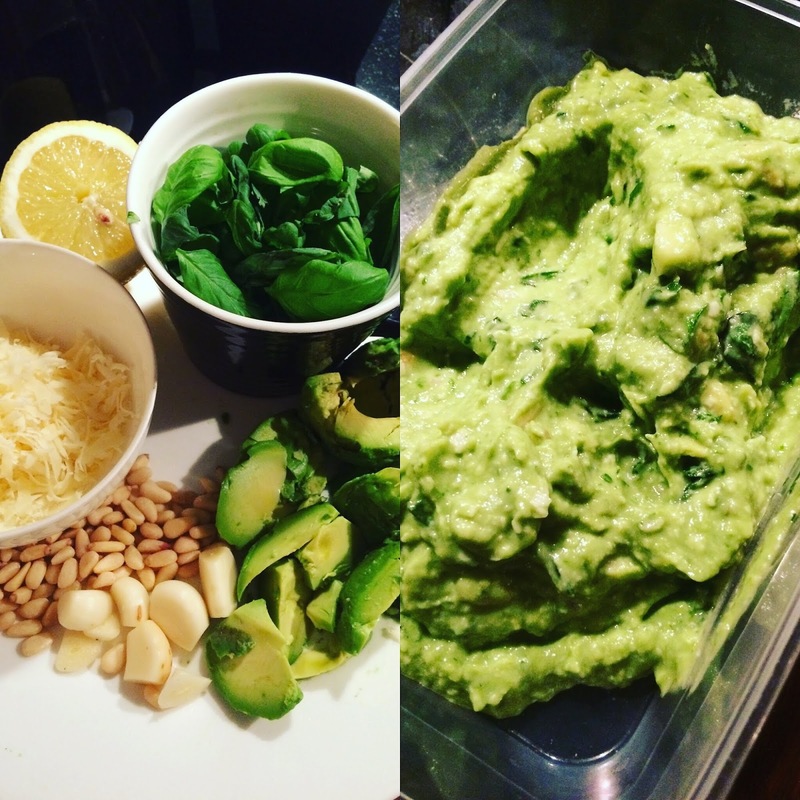 Combine the diced avocados, chopped basil leaves,pine nuts and garlic cloves in a food processor/blender. 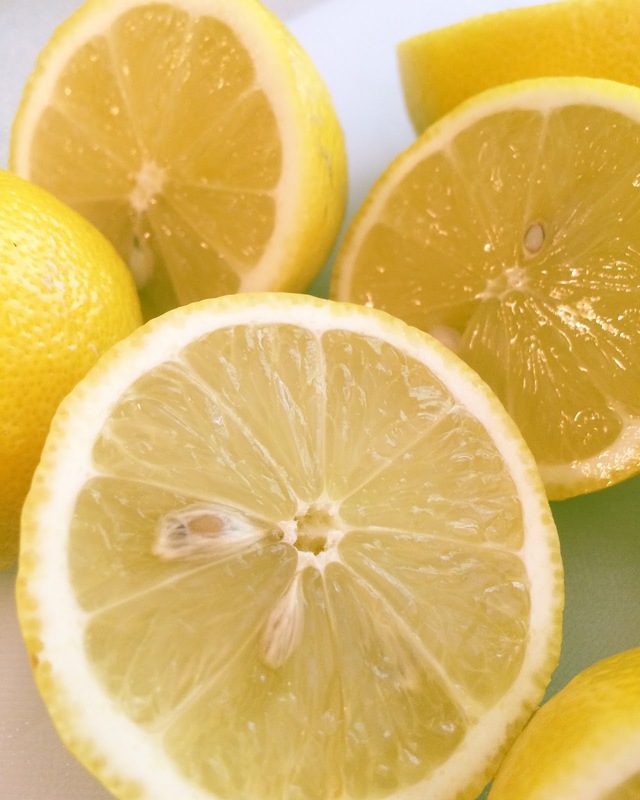 As you see them smoothing nicely together, stop and add the lemon juice and olive oil until all is of a smooth consistency or when it reaches the consistency you prefer (I always prefer mine to be slightly bumpy!). Season with salt & pepper (if you haven't already) and you're done!!! 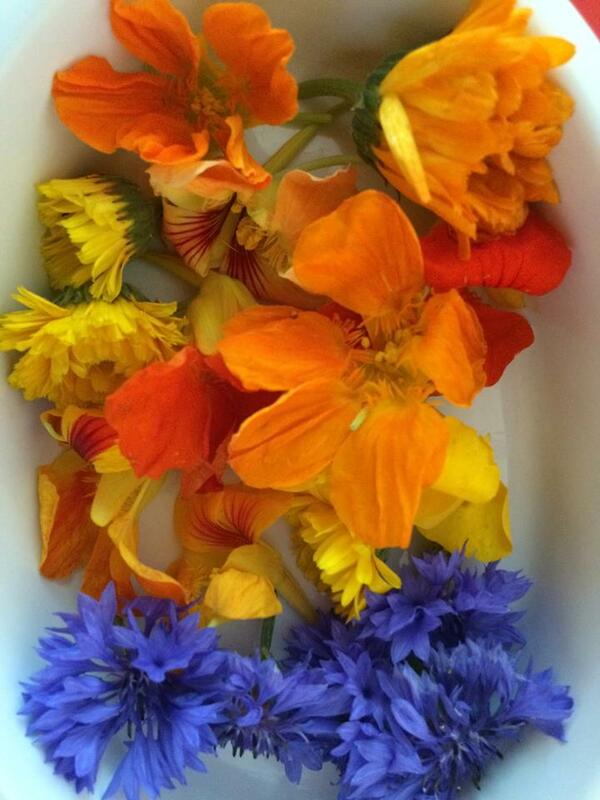 I have always been fascinated by pretty edible flowers, frequently having visions of myself as an old lady, inviting people around for an afternoon tea consisting of cucumber sandwiches, lavender madelaines, courgette cakes and rose tea. Even just writing about it now puts a smile on my face! So much for my love of edible flowers that I thought what better way to turn this fantasy into reality than by posting recipes and information here on my blog, and this way I don't have to wait until I am an old lady to do so! Spread the butter all over the salmon and season slightly. 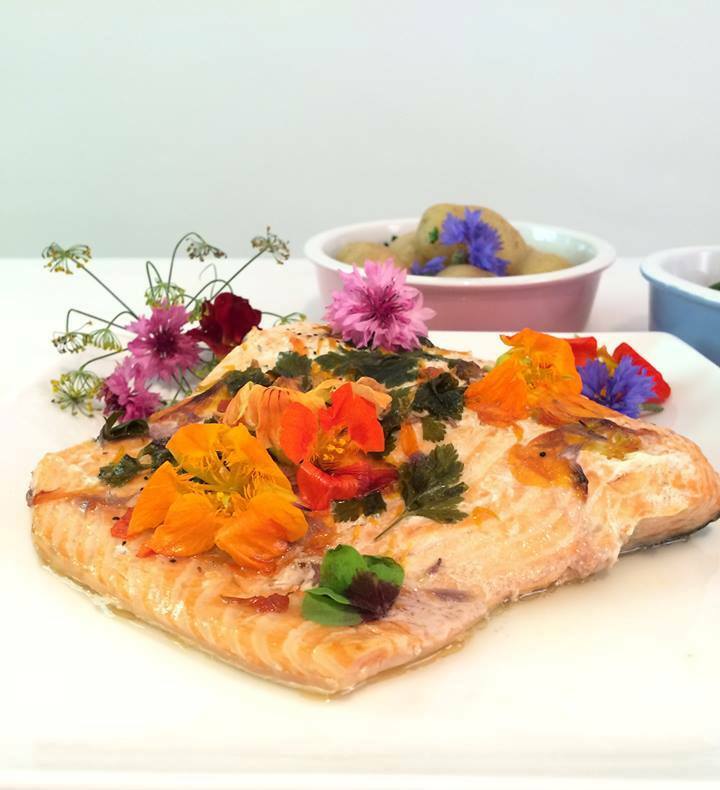 Place the flower petals and herbs all over the fish. Remove the fish from the oven and let it rest. * I ordered my flowers from the best! Maddocks Farm Organics, who were so helpful in advising on tastes of the different flowers, what's in season and when, alternatives, and accomodating to my specific needs. They were amazing and their flowers arrived cold, fresh and beautiful! Yes, it's Summer in the U.K!! and that means some super warm days & nights followed by some not so warm days& night!! This spiked peach lemonade by Maureen Petrosky will be ideal for any lovely warm evening. Whether you've just arrived home in a stressed and hot sweat, due to your sauna impersonated tube/bus journey back from the office or for a lovely balmy early evening with friends on the patio, preferably with a barbeque! Of course you can also drink this all day, any day, sans alcohol (or not! Whatever tickles your fancy). 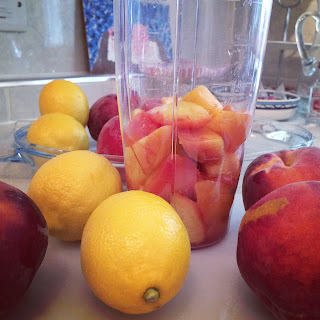 I have basically followed Maureen Petrosky’s recipe to a Tee! Well, with the exception of adding some cognac as well as the vodka! In a small pot, combine the cup of sugar & cup of water and let simmer on a low/medium heat until the sugar is dissolved. 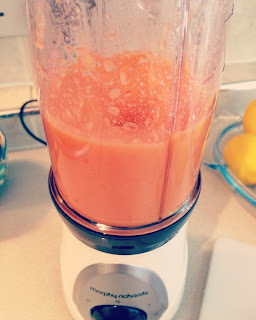 Remove from heat and leave to cool. Basically, you put a cross on the bottom of the peach, place in boiling water for 30 seconds and then directly into an ice bath. Once cooled – you peel with your fingers. Easy peasy!! Next, cut the peaches into cubes and place them in a blender and puree. 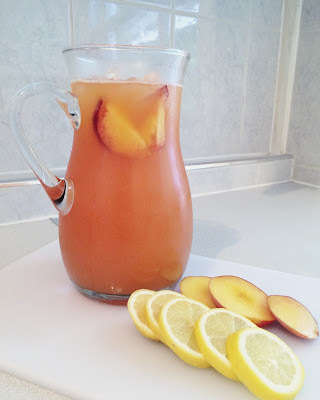 Now grab a large pitcher, combine the pureed peaches, the cooled syrup, the sparkling water, lemon juice, vodka and cognac and stir. Add loads of ice, stir again and voila! You are ready for some refreshing, delicious drinking!